JazzCircle – Keep informed about the local and wider jazz scene . If you want to know what's going on , be jazzwise and follow the JazzCircle . Feedback welcome! Together let's make this great site even better! Keep informed about the local and wider jazz scene . If you want to know what's going on , be jazzwise and follow the JazzCircle . Feedback welcome! Together let's make this great site even better! אנו נרגשים לשתף אתכם שהוזמנו להופיע בסוף חודש מאי בפסטיבל khamoro בפראג, צ’כיה. פסטיבל שכולו מוזיקה צוענית על כל גוונייה. בפסטיבל יופיע גם נגן הגיטרה הצועני הידוע Angelo Debarre אחד מהאומנים המוכרים ביותר בסצנת הסווינג הצועני. נפגש בשעה 10:30 לפיקניק מוזיקלי במתחם המנזר היפהפה, בו שרידי כנסיה ביזנטית מן המאה ה-5. חברי “קהילת הסווינג הצועני” יחברו לג’אם סשן עד לתחילת הקונצרט שיתחיל בשעה 12:30 באולם הקונצרטים של המנזר. בשמחה גדולה אנו חוזרים להופעה בפאב הפרה בשבי ציון! מאחלים לכם חודש נעים והרבה מוזיקה טובה! We are very excited to tell you that we’ve been invited to perform at the Khamoro Festival, which is devoted to Gypsy music in all shapes and forms, in Prague at the end of May. The well-known Gypsy guitarist, Angelo Debarre, one of the most highly acclaimed artists on the Gypsy Swing scene, will also be performing there. Join us for a special experience suitable for the whole family! We’ll meet at 10:30 for a musical picnic on the grounds of the beautiful monastery, where you can see the ruins of a Byzantine church from the 5th century. The members of the Gypsy Jazz Community will be jamming until just before 12:30, when our concert will begin in the concert hall of the monastery. Tickets to the concert will be available on site for NIS 50 for members of our mailing list (instead of the full price of NIS 70). Mention discount code 605. 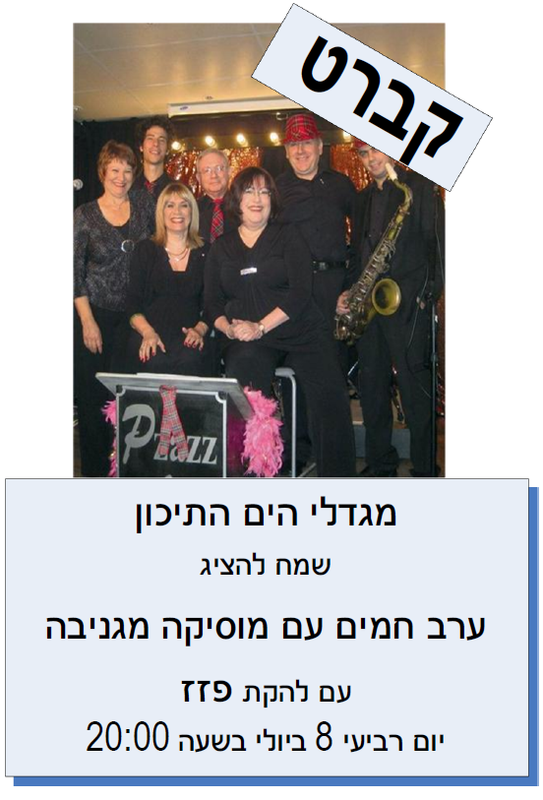 We are delighted to be making a return performance at the Para Bar in Shavei Zion! Wishing you all a pleasant month filled with great music! No, I have not been to any jazz performances since 29 March. But on 27-29 March I attended listmate Tamas’ Bohem Ragtime & Jazz Festival inKecskemet, Hungary. My third – and the best so far! Tamas Itzes on both piano and violin, Atilla Korb on trombone, trumpet and piano, József Torok on string and brass bass, and the ubiquitous Zoltan Matrai on various reeds. He is another world class musician, who could excel in any band worldwide. In addition to his own band, Tamas came up with a fantastic lineup: the Alderighis (Paolo and his wife Stephanie Trick) on piano, the Echoes of Swing (Chris Hopkins on alto sax(! ), Colin T. Dawson on trumpet, Bernd Lhotzky on piano and Oliver Mewes on drums), and the International All Stars led by Atilla Korb (Malo Mazurie – trumpet, Korb on his various instruments, Evan Arntzen – reeds, David Blenkhorn electric guitar, Sebastien Girardot – bass and Guillaume Nouvaux – drums). Musicians hark from all over: Hungary, Germany, England, Australia and North America (Arntzen was labelled Canada/US), although the English Colin Dawson resides and plays in Germany, and this, I believe, also goes for the Aussie Blenkhorn. The programme was extremely interesting. It started with the Bohems, followed after an intermission by the Echoes of Swing, on the second day there was a piano show with Trick,Alderighi, Lhotzky and Chris Hopkins, who is best known as a pianist and has a wonderful CD on Arbors (so does Lhotzky). On the last day I complained to management that one pianist failed to show up, to which management (Tamas) replied “I’ll play a number today.” The there was “duo special,” partners being selected by lot. A lovely show. In the evening it was Paolo Alderighi with Stephanie Trick, who gave an astounding performance. I sometimes complain about too much clowning on stage – not here; although they were extremely funny, ostensibly blocking each other’s access to the keyboard, for example, it never for a second affected their playing! They played on two pianos, one piano – four hands, and each solo. Paolo also told us about his trick to trick Trick away from the only piano they have at home. The Bohems do not refrain from clowning, either, but again – it does not affect their playing. I have taped most of what I heard, and I can tell there was clowning only by the bursts of laughter. And the musical programme was variegated, with many not so commonly played tunes. Bernd Lhotzky of the Echoes of Swing told the audience about a rehearsal at Hopkins’ house, at the end of which the musicians asked Hopkins to bring wine from his cellar. He came back, Lhotzky said in a dramatic voice, carrying a five litre bottle of absinthe,all of which was an introduction to the next tune – “Delirium.” A lovely tune, but when did any of you last hear it live? The Bohems, too, played tunes off the beaten track, but they have been together for many years and have developed a tremendous repertoire. The first and second days ended with jam sessions, but most participants were the festival musicians. On both evenings there was a trombonist who did not play at the festival, and on the first one – another very young trombone player (he participated in jam sessions at the previous Bohem festivals I attended). The last day ended with a grand finale, with all hands on stage. Something about the conditions: Due to renovations at the Cultural Centre, the festival was moved to the Four Points by Sheraton. The rooms were very good, staff friendly, but the conference hall where the concerts took place left a lot to be desired. The acoustic were hardly great, the floor was straight, so that the stage was not very visible from farther rows, so that they had to put a screen in the middle, and seating was on regular chairs. Kudos to Tamas and the sound people for having the amplification set in such a manner as to make the music clearly audible everywhere in the room, but not too loud! Musically, as I have already mentioned, it was the best – yet – of those I have attended (I definitely do not exclude the possibility of attending additional Bohem festivals).